Tis the Season for Vehicle Care. Cooler weather changes ahead means changing road conditions. Make sure your vehicle is prepared. 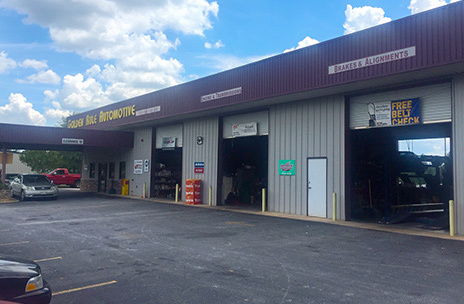 Bob and Greg Hicks opened Golden Rule Automotive in 1996. Bob has been in the auto repair business for 55 years, and Greg started helping his dad build show cars at the age of 3 (yes, that's true!). Both ASE Certified Master Technicians with L1 certifications, Golden Rule Automotive is the best place to go. With over 20 years of experience at the shop, Bob was formerly a Product Liability and Customer Service Representative for Honda Motor Company after deciding to put away his toolbox. Greg began certification and training the day after graduating from high school. Enjoying the satisfaction that comes from a job well done, the challenges that the auto repair industry offers, and the joy they bring to customers when their vehicle is safe and dependable are the main reason Golden Rule Automotive is still in business. Golden Rule Automotive has an ASE Blue Seal of approval and are one of the only AAA approved facilities in the Tri-County area, and are a supporting member of the International Automotive Technicians Network and support numerous local charities. WE FIX EVERYTHING! Honored by the AAA Motor Club as the Top Shop in Georgia and several prestigious Customers Choice for Newton and Rockdale Counties, we hope you choose Golden Rule Automotive as your local auto repair shop!